This post is a celebration of the beauty and invigoration fresh snow, and early winter days when a cold nose is not a drudgery. Instead, a rosy tip is acknowledged as punctuation to an exciting time as the season changes. During the early days of winter, fall has not quite relinquished its beauty. Animals and humans alike are fat-and-happy. Setting the poetry and light thesis statement aside, to all who read this, beware! Winter is here in Alaska, and for my friends in the lower 48, it seems it will descend upon you in short order! On Thursday a friend and I left for the North Slope for some caribou hunting (Note : I can’t leave that story open ended. I was archery hunting, and was a mere 3 seconds from success on two occasions but did not have the chance to deliver the coup de gras on some keen caribou.) The trip over the Brooks Range was marred by sloppy roads and rain. My truck was caked in thick mud which was slippery to walk on, not to mention drive on. Fast forward 60 hours, and the trip south revealed 8 inches of snow 80 miles north of Fairbanks which had fallen in our absence. What a change, and so quickly! It is likely that winter is here to stay, temperatures are staying around freezing during the day and dipping to the lower teens at night. The snow did bring some incredible beauty as only a first snow can. 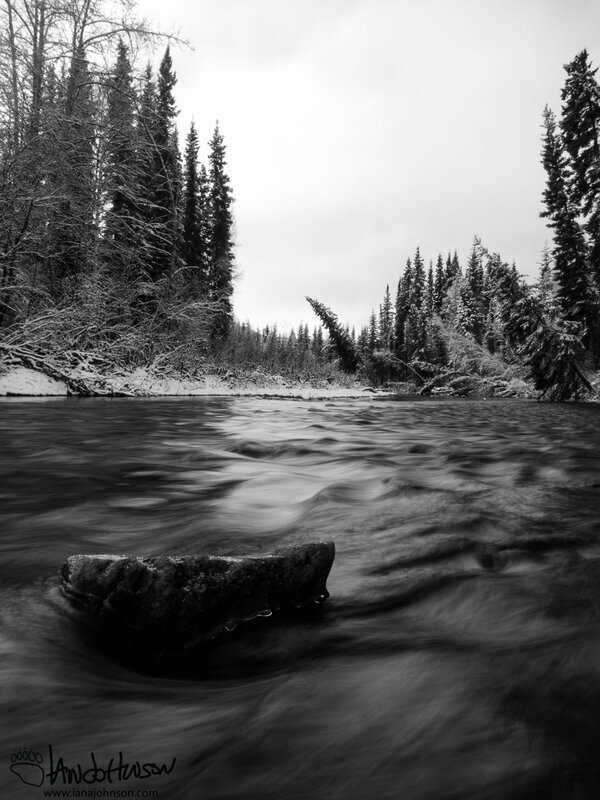 Rivers were still flowing, and the bending branches of snow-laden spruce leaned into river channels along the Dalton. 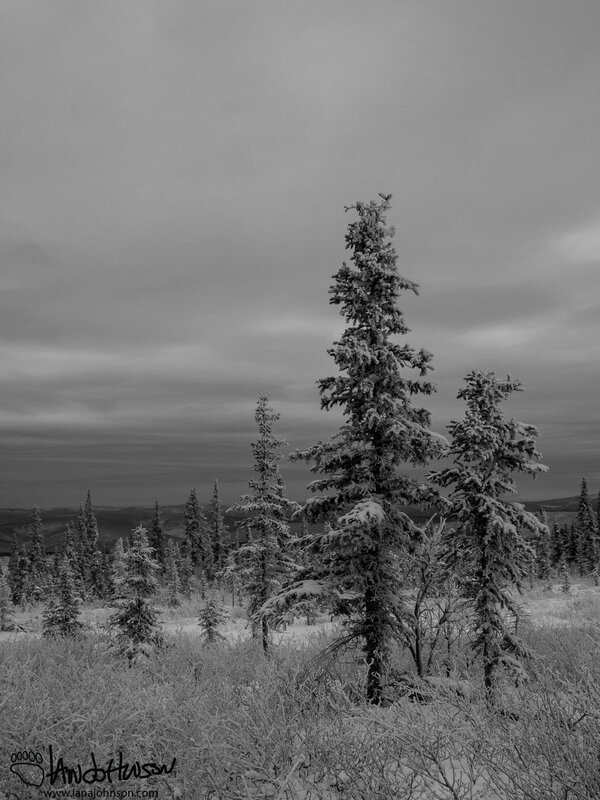 On Wickersham Dome ghost-trees already heavy with their first layer of hoar frost for the year kept silent sentry. 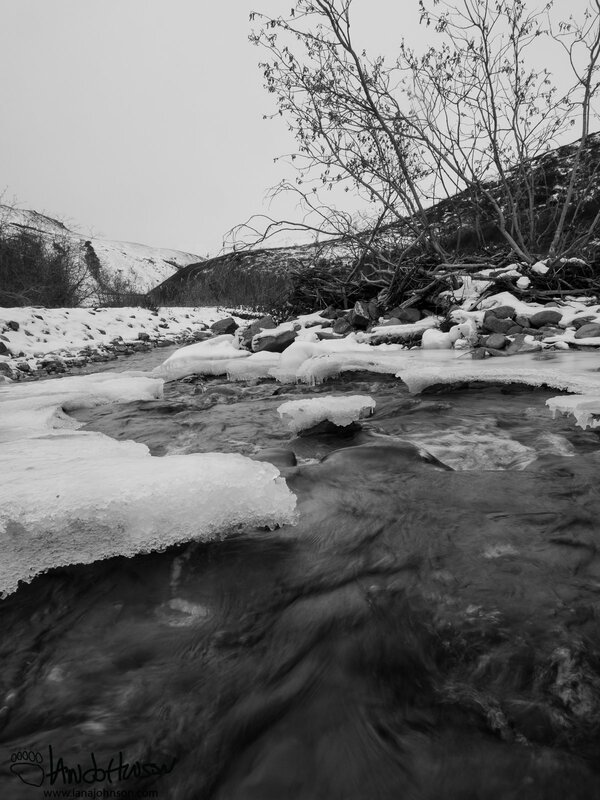 This black-and-white photo captures the flowing stream and the contrast of fresh snow to the water. The river just south of Chandlar Shelf was open and flowing, but probably not for long. Ice shelves covered a lot the river. 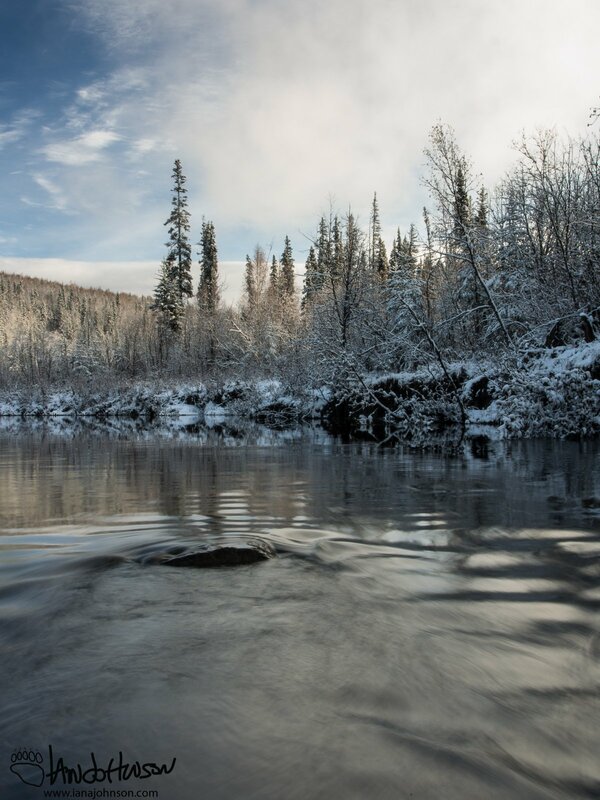 A slowly flowing streams meanders past snow-covered banks. So beautiful! 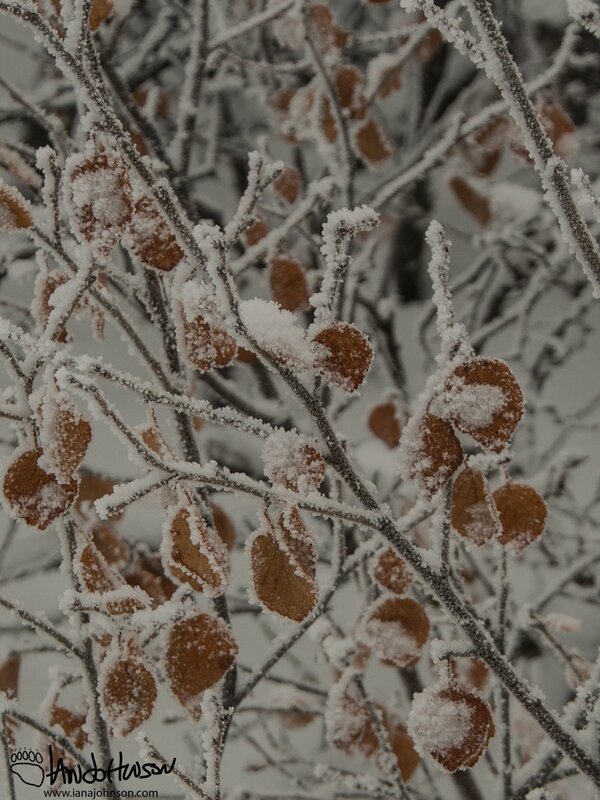 Some lingering dwarf birch leaves are ringed in hoar frost on Wickersham Dome. I did observe a very novel phenomenon – I would love to hear if anyone has witnessed this before! Behold, the snowbow. On our drive home we were met by gray skies and the hills were wreathed in falling snow. 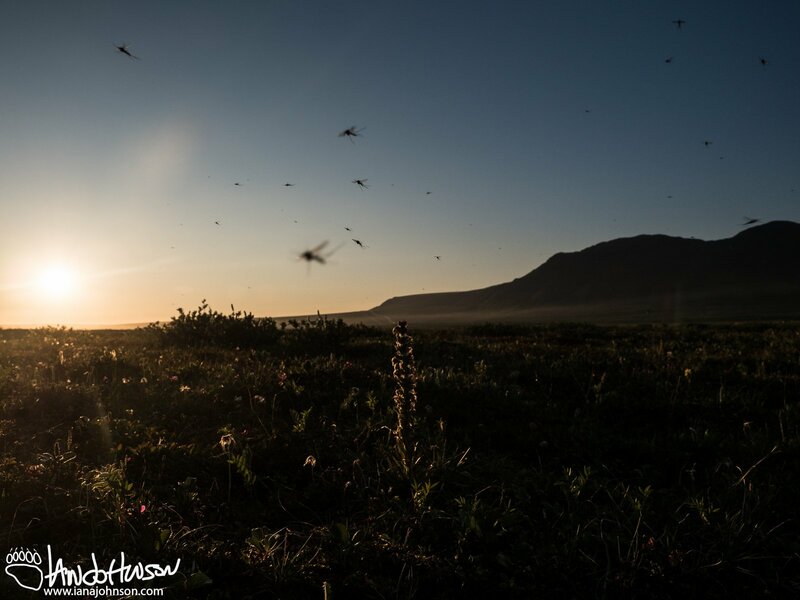 However, at the end of the Dalton Highway the sun broke and the landscape was lit as far as the eye could see. A snow cloud hanging low to the north of us caught the rays and formed a snowbow. 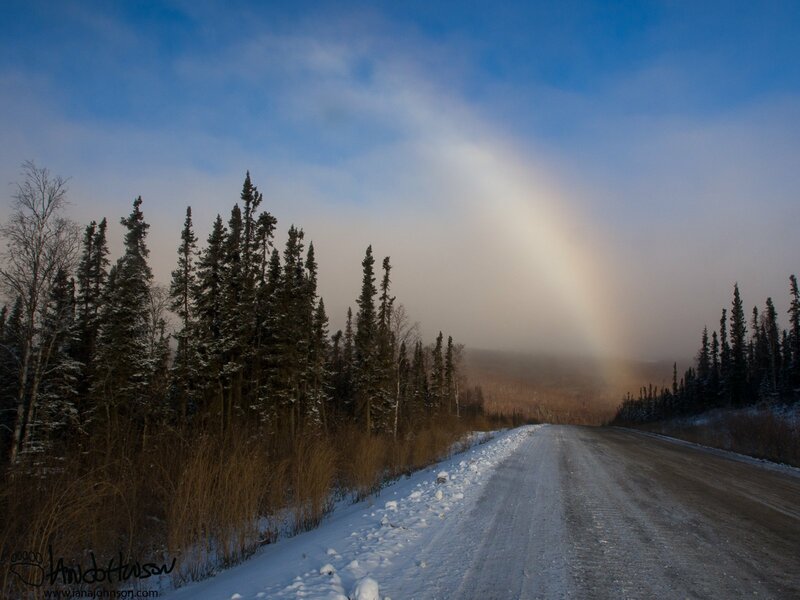 I have seen many sundogs, but had never seen a rainbow caused by snow crystals. 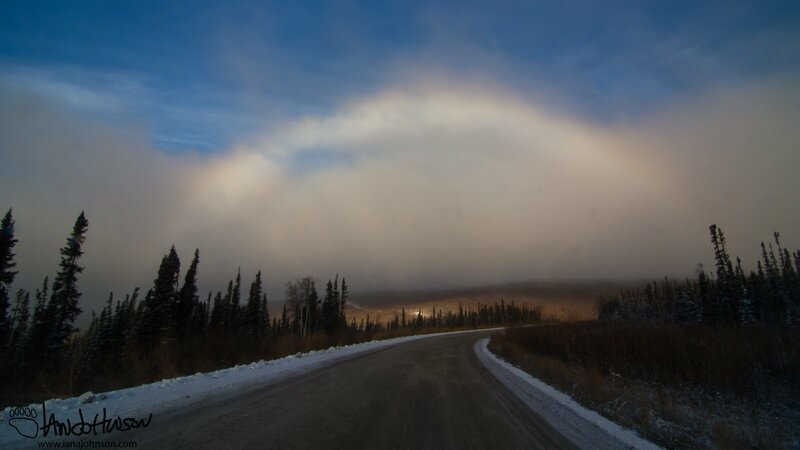 Here’s a new phenomenon – the snowbow! Although the colors were not as vibrant as a rainbow it was still beautiful. Has anyone else had the chance to see this before?? A full snowbow! The sun broke through at just the right time to create this stunning landscape. Pretty cool! I will leave you with this northern hawk owl which was a great bird to see along the way. These birds are known for their boreal habits. They spend the days on spruces watching for rodents and can be hard to spot. This was my first time seeing this bird, although they do occur in Minnesota in the winters during owl irruptions (i.e. owls heading further south than their ‘normal’ range due to environmental or food conditions). The clip below is a short one of a hawk owl behavior, cleaning. This northern hawk owl was a real treat as we headed south. They are boreal forest feeders which migrate south in the winters. 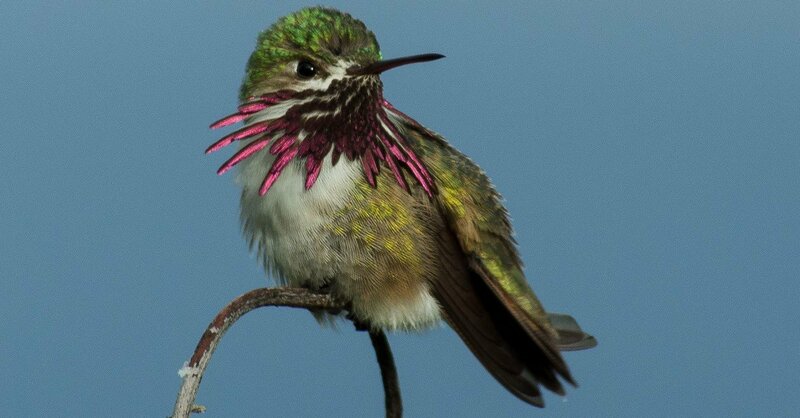 They are known for hunting during the day by perching on the tops of spruces looking for rodents. This black-and-white photo captures the snowy landscape of a hunting hawk owl.